In my previous post I finished the case of so-called “two-color” U.S. Navy camouflage, which was used between September 1941 and January 1943. You can observe on the archival photos that its non-specular Sea Gray / Light Gray combination was especially prone to weathering, and accumulated every grain of the soot and drop of the oil stains. Simultaneously the weathered Sea Gray paint became more and more white. The main difference is the dark Sea Blue section below the cockpit. It is creating a “bridge” of the Sea Blue color between the upper areas of the wing and fuselage. Most probably such a camouflage was applied by the Navy workshops, when the older aircraft were repainted from the “two-color” scheme. 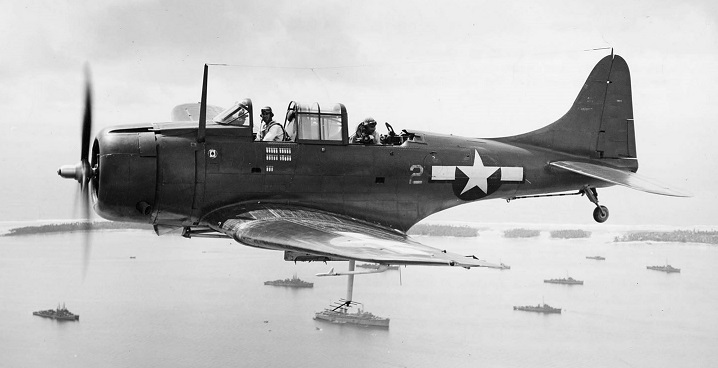 Note that all of the SBD-5s on this photo have larger national insignia than the “white 35” from Figure 78‑1. Their stars have precisely the same size and location as those in the two-color scheme. (It seems that the workshops just painted the two rectangles on each side of an existing roundel). You can also encounter aircraft that had the “bridged” camouflage and the smaller (i.e. standard) insignia, but it seems that all aircraft without the “bridge” below the cockpit had the standard roundels. This fact seems to confirm the “workshop” hypothesis of the “bridged” camouflage origins. Many modelers think that this variant of the tri-color scheme was created in the main Navy overhaul facilities at Norfolk. This SBD-5 seems to be n much better condition that the weary SBD-3 from my previous post. From the photos of the other VB-16 aircraft it seems that the crew of this squadron had enough time to take care of their machines. All of them had uniform squadron emblems, the flying staff names were painted below the cockpits, and every mission was marked with a small “bomb” on the fuselage. Unlike on the SBD-3, on this SBD-5 the anti-slip strip ends at the main spar (there is no forward part, painted in the glossy black). There are no visible deep (“bare-metal”) scratches on the center wing upper surface. Just some irregular areas and a few seams of the dome rivets are brighter. Most probably the paint was scratched from the heads fo these rivets. (There is no such a thing in the front of the main spar, because its seams were made of the “flat”, countersunk rivets). I started my work on this camouflage by creating a new copy of the previous source GIMP file (Color.xcf). Then I modified its contents by repainting some key layers. Finally I exported the resulting pictures, overwriting the existing images (texture components in the skin material of my model). This first render revealed that while the non-gloss surfaces look quite convincing, I had an issue with the more glossy upper surfaces. The dirt pattern disappeared on the highlighted areas. They look unrealistic smooth and clean (like on a polished airliner!). I also could put these splashes on a white background. However, I did not know if I would need some lighter elements. That’s why I used a neutral gray here. In this case the only bare-metal spots are the heads of the dome rivets. I recreated them using an inverted copy of the reference image. I also added some partially scratched areas in the front of the anti-slip stripes (they “reach” just the primer color). In overall, the tri-color painting looks acceptable. However, this model badly needs the details: the cockpit interior, radial engine, crew… Thus, in this post I am finishing the third phase of this project (“working with textures and materials”). Now I am starting the last, fourth phase: detailing. For most of the small parts that I will create in this last phase, I will use simpler materials that do not require any UV-unwrapping and texture images. For example – on the picture above the propeller hub requires different material (in this “white 35” it seems to be painted in a glossy Sea Blue). At this moment I kept the hinges and canopy rails in the natural metal color. I will have to “repaint” them, using simpler versions of the camouflage colors. Finally, it seems that I have to improve the glass material of the cockpit canopies (comparing with the archival photos, they are too “clear”). Anyway, I will describe my solutions to all these issues in the future posts. In this source *.blend file you can evaluate yourself the current version of the model, and here are the Inkscape and GIMP source files of its textures. Because of the large size of the original GIMP file (*.xcf), this post is accompanied by its smaller version (2048x2048px), packed into *.zip file. I think that such a version is sufficient for checking all the details of this image (the structure of its layers, their opacities and mixing functions). The resulting textures (4096×4096) are packed into accompanying Blender file. Is it possible use source SVG as vector texture in Blender 2.78 directly? Unfortunately, not. 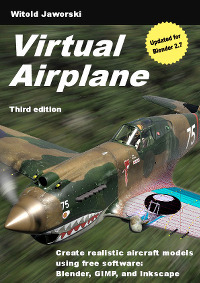 Ten years ago, when I started to play with Blender, I wrote a plug-in for Blender 2.4 that directly used SVG images as textures. (See its description). Have you tried to display your Blender models on WebGL? I have been unable to get the textures to work. To implement reflectivity, I split the model in two objects. – one reflective and one not. I was unable to get other types of maps to work well or at all (e.g. bump maps). WebGL is another (simpler) rendering engine, based on the Open GL 2.0 standard. This means that the effects you can get in WebGL will be less “spectacular” than in my original models in Blender. I have no direct experience with WebGL.